Next To The Birth Of My Children And My Marriage, This Grand Canyon Vacation Was The Most Amazing Event In My Life!!!! You must admit that Western River doesn't have to work hard to enhance the product. After all, there are no words to describe the magnificence of the Grand Canyon; however, the professionalism of the organization, the personalities of each of our guides (Brian, Lindsay, Shad and Nick), the gourmet food, the ease of the set-up and break down of our equipment, the choice of the daily hikes and sites, the extensive information about the topography, the laughs about the bathroom "situation,"and the wonderful people that experienced this Grand Canyon vacation together made this the best trip of our lives. From watching the sun rise to the moon casting its shadows, to the stars overhead or the cool breezes, everything couldn't have been more perfect. Our group bonded so beautifully that I will truly miss each and everyone of them. 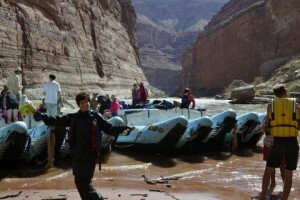 If you decide to take one vacation in your life that will change your life forever, Western River Expeditions is it!!!!! !